With the frontend car submissions functionality you can now turn your WP Car Manager website into a true car marketplace. 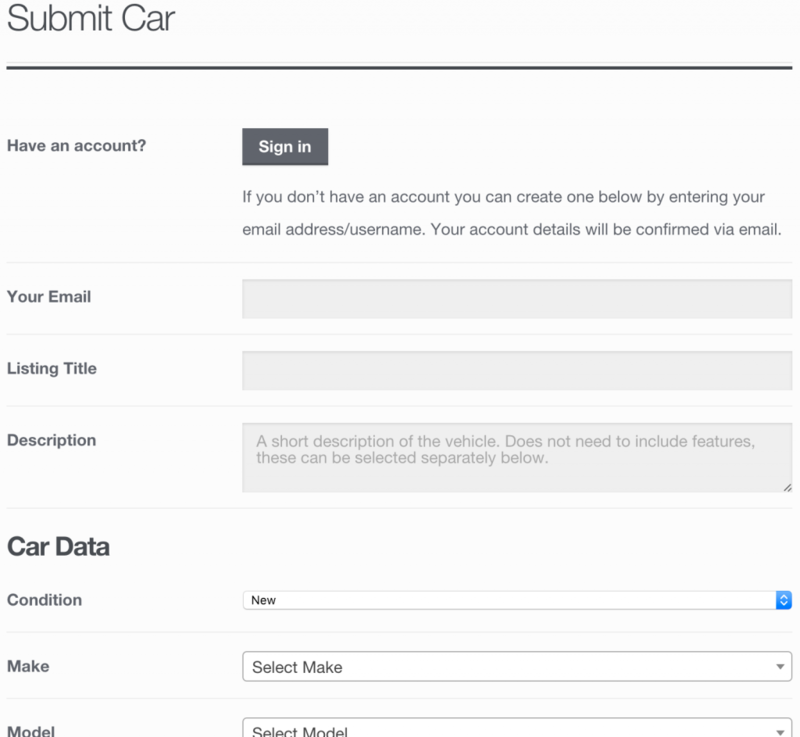 In the new settings tab “Car Submission” you can customize the behaviour of the user submitted car listings. For example, you can choose to let user submitted car listings automatically expire after an X amount of days. You can choose to let your visitors automatically create an account on your website, set what role these new accounts should be and if you need to approve new listings or if they will be published automatically. The new version also comes with more advanced listing features. We’ve added the possibility to list only cars of one specific make, allowing you to create make specific pages. We’ve also added the possibility of only listing cars with a specific condition as well as setting the default sorting of your car listing. All these new listings features/filters are introduced as new shortcode attributes so you can use different filters at different pages and can combine them the way you like to. Although the next version’s feature list is still open to suggestions, we’re already working on adding various payment options for your car listings. These new payment options will allow you to charge your users to list a car on your WP Car Manager powered website. I’m very excited about this release and about the possibilities it opens for feature functionality. The first responses of users has been very positive and I’m looking forward to see more WP Car Manager powered WordPress websites. So if you’ve built (or are building) one, please do let me know by leaving a comment below. You can of course also send me an email via our contact form. Hello Barry! ..your work is very great, I’m using it for now for testing purpose on http://www.autousate.us/parco-auto/ …soon I will use it on the site of a customer (Vauto), and I will let you know! I’ve developed an import system from Modix (a car manager software), and now I’m trying to “hack” your code to add some fields and filters that I need… I suppose is a very well written code, so I will learn a lot, and for sure in future I will use your plugin on the sites of other customers of mine. Really thank you!!! I’m working on my site at the moment but I’ve very stoked to use your plugin as one of the main functionalities of the entire platform. I just wanted to add; will you possibly consider adding a format like this. Where we can have custom fields and pages for “dealerships”? Have you considered adding post id or car slug to the shortcode filter? It would be really handy to enable the selection of say a handful of specific cars. If it’s possible I’d love to know – again many thanks for your hard work and great plugin.